We’d love your help. Let us know what’s wrong with this preview of On My Own by Florence Falk. At some point over the course of the average American woman’s life, she will find herself alone, whether she is divorced, widowed, single, or in a loveless, isolating relationship. And when that time comes, it is likely that she will be at a loss as to how to handle it. As a society, we have an unspoken but omnipresent belief that a woman alone is an outcast, inherently fl At some point over the course of the average American woman’s life, she will find herself alone, whether she is divorced, widowed, single, or in a loveless, isolating relationship. And when that time comes, it is likely that she will be at a loss as to how to handle it. As a society, we have an unspoken but omnipresent belief that a woman alone is an outcast, inherently flawed in some way. In this invigorating, supportive book, psychotherapist Florence Falk aims to take the fear, doubt, confusion, and helplessness out of being a woman alone. Falk invites all women to find their own paths toward an authentic selfhood, to discover the pleasures and riches of solitude, and to reconnect with others through a newfound sense of self-confidence. Like so many women before her, Florence Falk found herself divorced, alone, and unsure of herself. Soon she realized that by embracing her solitude for what it was—a potentially enriching and life-altering experience—she could turn what once would have felt like “loneliness” into a far more positive and empowered “aloneness.” Falk notes that each of us has two opposing drives: one causes us to yearn to make close connections with others, and the other pulls us back into ourselves, into the need for selfhood and certainty that can only be shaped through solitude. In order to be whole, she says, we must heed both of those impulses. But in our modern culture, the former is stressed while the latter is neglected, even vilified. On My Own boldly shifts that paradigm. With inspiring, intimate stories of women from all backgrounds, Falk illuminates the essential role that being alone plays in women’s lives. Whether she is in a stable relationship or on her own, every woman must learn to be by herself; for if she can be fully free, unfettered by society’s stigmas about being alone, life and all its possibilities will open up for her. And as Falk demonstrates, once a woman has discovered the richness of solitude, she is not likely to give it up so easily. To ask other readers questions about On My Own, please sign up. I think the title is a little misleading. The book is really about what it means to be a woman in her own right as separate as possible from societal pressures that force so many women to suppress their real life passions. It's written by a therapist based on her experiences helping women discover their true selves, so it's very anecdotal. It's about embracing oneself as whole person with a unique identity that is not directly tied to one's role. Being newly single for the first time in about ten years, this book is a life saver. It has been my therapy in getting through separation, filing for divorce, another break up and ultimately living alone in a new town with a new job, trying to make new friends. 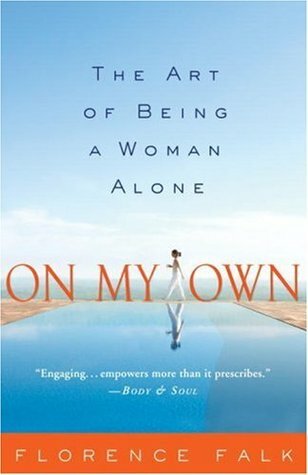 I recommend it to any woman who feels that they are "going it alone" even in a small way. This book renewed my faith in girlfriends, and in myself. I did enjoy this book very much. It mirrors a lot of the feelings I had when thinking a lot about being alone, not "with somebody". It confirmed my belief that being alone is not something to be ashamed of, or something that marks you as somehow lacking. But instead it's a time to explore who you really are, a time to enjoy and ultimately it's an enriching experience. However, I also felt this book was repetitive, and if you're really grappling with adjusting to aloneness, it does not offer any I did enjoy this book very much. It mirrors a lot of the feelings I had when thinking a lot about being alone, not "with somebody". It confirmed my belief that being alone is not something to be ashamed of, or something that marks you as somehow lacking. But instead it's a time to explore who you really are, a time to enjoy and ultimately it's an enriching experience. I bought this book for my own sake - to take the information in here and apply it to myself. But I got more out of it than that. Falk's compassion for all women rubbed off on me and reading the book became a way to connect with the women in the stories she presented. This book has made me excited about my alone time. I think I'll go on vacation for a month to get a taste of real solitude! I loved the stories of women clients, her insights and wisdom. Not so much a self-help book as an empowering reminder of the difference between being "alone" and "lonely" and that society still defines a woman's status according to her relationships. A really helpful guide to discerning "aloneness"
This book was a powerful book, and truly insipiring. Though I am not able to relate to the author and what she is writing about in some ways, but in others I am. This book opened my eyes to realize the struggles that a lot of women go through these days, and all alone. Yes, I would recommend this book. A Bible for every woman. It enables a true woman inside every female to emerge and reach to her full potential. I felt a little gyped when I started this book to find out that the author was raising childen after her divorce. That to me is very different than being completely alone, as children are company/companionship of a sort - though I understand it's not the same as having a partner. She makes a good point about the cultural emphasis we have on "packaging" ourselves up to be appealing to men (or women) with the point being to be part of a couple. The other good point that she makes is that we don't I felt a little gyped when I started this book to find out that the author was raising childen after her divorce. That to me is very different than being completely alone, as children are company/companionship of a sort - though I understand it's not the same as having a partner. She makes a good point about the cultural emphasis we have on "packaging" ourselves up to be appealing to men (or women) with the point being to be part of a couple. The other good point that she makes is that we don't know what the future will hold. We don't know what will happen next week, so how can we be fatalistic about the rest of our lives. So, yes, the "always" and "nevers" that often come up in our thoughts for the future probably can be stricken. She is a bit repetitive... and I didn't find any strategies for how to learn to be alone successfully. If anything the book was a bit depressing for it's reminders that older women have fewer choices regarding a mate (older men want younger women and often get them), and that you might just end up alone. Which, while true, wasn't exactly what I had hoped to get out of the book. More than likely, at some point in our lives, we are all going to find ourselves alone. Relationships fall apart. Children leave home. Our spouse passes. It’s sad and rather scary when we enter a new phase of our life but what’s really awful is the terror we put ourselves though. It’s the new millennium. Women have secured the right to vote and work alongside men in most any job that suits their fancy. Yet, somehow we still see a woman without a man (and by association, children) in a negative l More than likely, at some point in our lives, we are all going to find ourselves alone. Relationships fall apart. Children leave home. Our spouse passes. It’s sad and rather scary when we enter a new phase of our life but what’s really awful is the terror we put ourselves though. It’s the new millennium. Women have secured the right to vote and work alongside men in most any job that suits their fancy. Yet, somehow we still see a woman without a man (and by association, children) in a negative light. No one even considers that this woman might not need (or want) a companion. That she might be complete by herself. That she might even be happy and fulfilled. Instead, the thought is that there must be something wrong with this woman if she can’t catch a man. Moreover, we are so terrified about such judgments that we will do almost anything to have a man, even if he’s the wrong man. While this book talked about some good points, the overall tone of the book was very slow. I forced my way through the end of it. Focuses very much on heteronormative, monogamous relationships. At the end of the book, the author mentions something about homosexual relationships between women. I only wish that some of these accounts were shared throughout the book. Overall, the book is self perpetuating--almost a sob story within itself, sharing the idea that women need to have solitude, but plan While this book talked about some good points, the overall tone of the book was very slow. I forced my way through the end of it. Focuses very much on heteronormative, monogamous relationships. At the end of the book, the author mentions something about homosexual relationships between women. I only wish that some of these accounts were shared throughout the book. Overall, the book is self perpetuating--almost a sob story within itself, sharing the idea that women need to have solitude, but planting the idea that the only way to find that solitude is through some kind of break from the kinds of relationships that put you in a negative predicament. This book covered a topic not often considered in the plethora of self-help manuals flooding the book markets: how to successfully live as a woman without a mate. While I was intrigued by this premise, I found the author to be somewhat redundant in the presentation of her ideas, with more anecdotal references than original thoughts. Yet and still, I it did lead me to new considerations about the solitary woman's place in American society. Written by a psychotherapist, one who has not had the occupation throughout the entirety of her adult life. Interesting varied perspective gleaned from her own experience and stories from other women as told to her. An unpretentious and likable narration. Probably would appeal to most women. Sisterly and reassuring. Probably more appropriate to a more mature age group than myself, yet I found it to be a compelling read. This book was helpful for me to see being alone as not lonely, but actually full filling of my own needs and self-discovery. It made me realize that it is healthy for my own spiritual development and expansion of creativity. Though it can be hard, it is necessary to embrace time alone instead of always relying on having a man that isn't right for me out of fear of being alone. I'm setting this aside while I work on school assignments, but I'm definitely coming back to this - because it's an amazing perspective to consider ways that society tries to tell me that I'm wrong because I don't have a man in my life. In actual fact, I'm more right now than I've ever been before! Another often recommended book to my clients. If you are struggling with loneliness, or afraid of being a woman alone in the world, this book is a powerful read. Florence Falk will help you shift from fear and shame to empowerment, grace and joy. I didn't finish this book. It read the first few chapters and the auther seemed to repeat herself, but with differant ways of saying the same thing. So I prettty much got what she had to say and moved on to another book. I enjoyed it but there is a disconnection between chapters which seem repetitive.I perceived the sequencing in this book slightly and unnecessarily off.Overall I truly appreciated this book and recommend it to my friends. There's quite some food for thought here, but even though I agreed with what I read, no big ideas stuck with me. It seems that this would be a good book to take notes from so that you can use them as springboards to further growth. This is an awesome read for any woman facing the worl alone and not in a relationship. It teaches how to be ok with this even though society teaches us different. For the single woman trying to wade through the "So when are you getting married? and So when are you going to have kids?" questions. This is a great read for all women. I am very happily married and I am on my own - as are we all. Jump into this book and you'll be captured with new insights and vigor for living your own unique life. There are some wonderful mini-bios and bits of advice and information in this book. It's not just about women alone, as in w/o partners, but about how to be at peace with ourselves no matter what. This book reminds us of the multifarious gifts that we can give to ourselves by actively engaging in solitude. Odd, repetitive, heavy on the self-pity. Author Is raising children and has large, close family, but considers herself "alone" because she no longer is married. This is more of a 3.5, I think. It was an interesting read, mostly for the discussion of the differences between "aloneness" and "loneliness."